iPower Review 2019: Is iPower a Good Hosting? IPOWER is an American hosting service dedicated to providing simple and comprehensive hosting solutions for small to mid-sized businesses all over the world. They focus on individual clients and small business operations that can make the best of their unlimited hosting plans. IPOWER is an American hosting company that’s been in operation since 2001. The company owns two state-of-the-art data centers in Boston, boasting superior hardware, 24/7 security, redundant power and A/C systems, and load balancing technology that all work to serve over one million users all across the planet. IPOWER provides hosting services tailored to small and medium business enterprises. They’ve created their own custom control panel dubbed vDeck, which gives their customers access to over 200 applications, services, and tools with which to create and maintain their websites. IPOWER’s range of solutions includes shared Linux and Windows hosting, VPS hosting, managed WordPress hosting, and dedicated servers. I was actually glad to see that they offered dedicated WordPress hosting; most hosting providers tend to simply pre-install WordPress on a shared hosting plan and then leave it at that, but IPOWER has clearly put in the extra effort to create a more streamlined WordPress experience for their users. 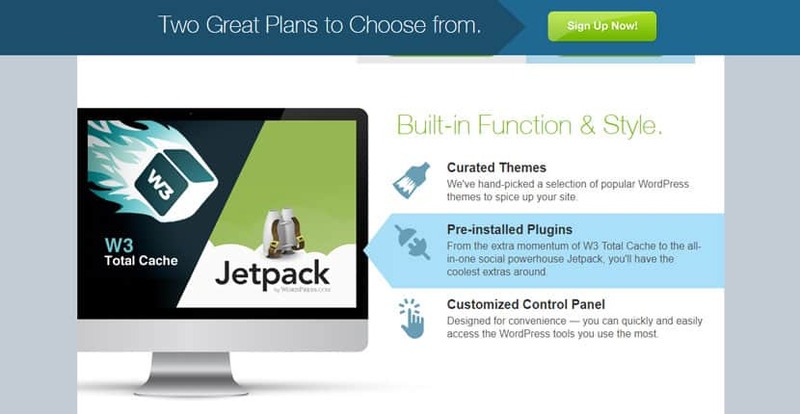 Their packages include a hand-picked selection of the most popular WordPress themes along with pre-installed plugins, a customized control panel, servers and security features specifically optimized for WordPress, and of course, a free domain registration. IPOWER also has a fairly standard range of shared hosting packages. If you’re looking into launching an e-commerce website, their Pro plan will be of particular interest to you: this includes a free domain registration, up to 15 products using the ShopSite Shopping Cart software, a website builder, support for scripting languages, and even free marketing guides. One thing that was rather disappointing though: IPOWER does not include free SSL certificates in any of their packages, so you’ll have to purchase these separately. They also don’t appear to have any server or network uptime guarantees. IPOWER’s plans are actually priced slightly higher than the market average, though they’re still fairly affordable. Unfortunately, they employ one of the hosting industry’s age-old pricing tricks: they advertise an extremely low promotional rate to draw you in, after which the plan is renewed at the regular rate (which in this case is several times higher than the promotional rate). Considering the fact that SSL certificates have to be purchased separately — and that SSL certificates are a must-have according to Google’s search engine algorithms — this was a huge minus. One plus, though, is that the company offers free AdWords and Bing Ad credit with any plan, so you can launch a good marketing campaign right from the start. This is not something you get every day — especially not for free. They also have a 30-day money back guarantee with their shared hosting plans. Their support is excellent, fast, and reliable with loads of options. There’s a knowledge base that can help you figure out any type of issue. On top of that, there’s a 24/7 toll-free phone number available along with a live chat option. I found their agents polite, friendly, and helpful; all in all, I was satisfied with their level of support. IPOWER is an excellent choice for those who are new to the hosting industry. Whether you’re a blogger, an entrepreneur, or a mid-sized business owner who’s been running the company for a number of years, you’ll have plenty of options to choose from. Wondering how iPower stacks up against other Web Hosting companies? Enter any other Web Hosting company and we will give you a side-by-side comparison.